CHICAGO – It’s incredibly rare to be able to say this – the third installment in a hit animated franchise could arguably be the best. 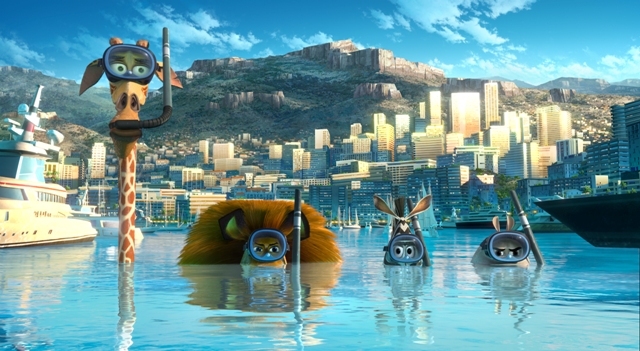 “Madagascar 3: Europe’s Most Wanted” is certainly more fun, clever, and enjoyable than the last film in this series and probably holds its own against the original. It’s not perfect – it’s often more hyperactive than it needs to be – but the film is grounded in the arcs of its beloved characters and presents some exciting new ones, fun settings, and funny dialogue. It’s far from an animated masterpiece but it is a fun diversion for young and old. Alex the Lion (Ben Stiller) is still dreaming about getting back to New York, back to his fame as the lead attraction at the zoo. Having been left by the penguins in Africa, he checks off the days that they don’t fulfill their promise to return for him and his friends – Marty the Zebra (Chris Rock), Melman the Giraffe (David Schwimmer), and Gloria the Hippo (Jada Pinkett Smith). Having grown tired of waiting, the group, including Julien (Sacha Baron Cohen), Maurice (Cedric the Entertainer), and Mort (Andy Richter), pack up and try to chase down the penguins in Europe. There they run afoul of a notorious animal hunter police officer named Captain Chantel DuBois (Frances McDormand), who desperately wants a lion head for her collection. To escape the fuzz, Alex and the gang stowaway on a train filled with circus animals. The circus has a few shows across Europe and then one big one in London that’s designed to attract an American investor which would bring the group back full circle to the States. Alex, Marty, Melman, and Gloria could make it home again. They just have to learn a few high-wire acts. Bryan Cranston, Jessica Chastain, and Martin Short all do excellent voice work as members of the European circus. The writers (which includes, believe it or not, Noah Baumbach) of “Madagascar 3” clearly know and like these characters. They don’t clutter their arcs with too much nonsense and wisely keep the story as focused as it can be on its clear themes – community, friendship, and the importance of staying true to your own dreams. Don’t let missteps bring you down. If you fall off the high wire, hit the safety net, and climb back up the ladder. It’s a solid if familiar theme for a kid’s movie but it’s well done enough here not to feel clichéd. Having said that, “Europe’s Most Wanted” falls victim to the common fault of so much major non-Pixar animation – hyperactivity. Every scene needs to be pitched to eleven with eye-popping 3D and probably a Katy Perry track. The movie never catches its breath. Even when Alex goes to meet a sea lion named Stefano to discuss a plot point it has to turn into an action sequence. 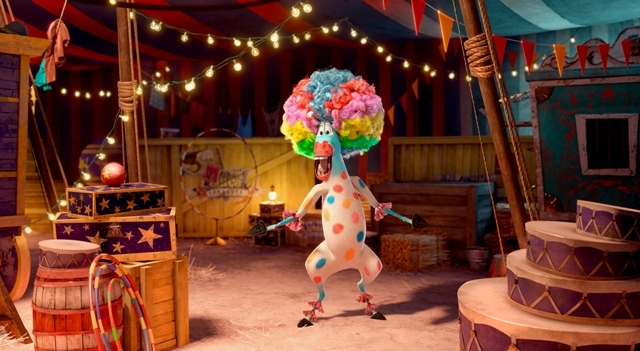 There are no “small” moments in “Madagascar 3” and the film could have been more engaging if it calmed down for just a second even if I do understand the assumed need to be constantly moving to keep the little ones engaged. Pixar (and, to be fair, some DreamWorks) has proven that storytelling and character can do it as often as intense visuals. The voice cast for “Madagascar 3: Europe’s Most Wanted” is very strong and amply supported by new talent. The core group from the first two movies delivers again without sounding lazy like voice talent often does this deep into the franchise and the new cast members truly deliver. McDormand is having a blast as a total lunatic and Cranston shines as a Russian tiger with a dark past. 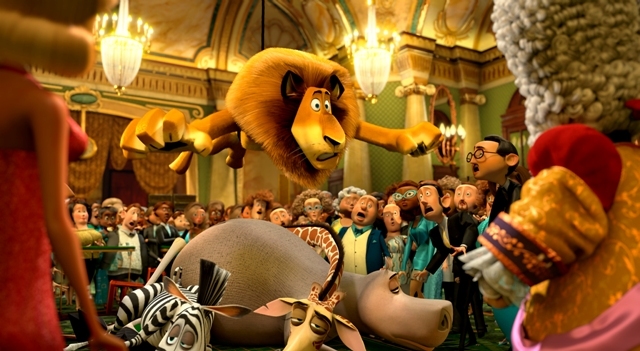 “Madagascar 3” is just unpredictable enough (a plot arc involving Cohen’s Julien falling in love with a tricycle-riding bear is one of the most wonderfully weird things I’ve seen in a major animated film in some time) and emotionally engaging enough to work for adults and it’s absolute eye candy for kids. Most animated franchises are so creatively bankrupt by the time they reach a third film that critics hope for their failure just to not have to sit through a fourth. While I like the way “Europe’s Most Wanted” ties up this entire franchise, I actually found myself thinking that I wouldn’t mind a fourth adventure for Alex, Marty, Melman, and Gloria. “Madagascar 3: Europe’s Most Wanted” features voice work by Ben Stiller, Chris Rock, David Schwimmer, Jada Pinkett Smith, Bryan Cranston, Jessica Chastain, Frances McDormand, Sacha Baron Cohen, Cedric the Entertainer, and Andy Richter. It was directed by Eric Darnell, Tom McGrath, & Conrad Vernon. It is rated PG and opens on June 8, 2012. Submitted by ziggy one of th... on June 9, 2012 - 10:32am. Submitted by Manny be down on June 9, 2012 - 10:43am.